The mysterious Hidden Palace Zone in it's half glory. This page tells the baffling tale of the level which was semi-complete, but taken out of the final game, and also shows the first picture of a prototype Master Emerald. This image shows the beginning of the level. Hidden Palace Zone is also the home of many robotic creatures never to appear in the final game in any form. The first is this T-Rex robot, which just runs from one side to the other not making much of a nuisance of itself. 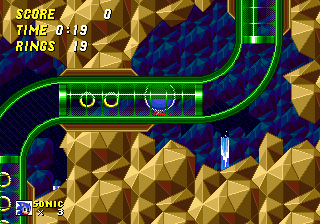 It reacts similar to the Moto-Bug from Green Hill Zone in Sonic 1. 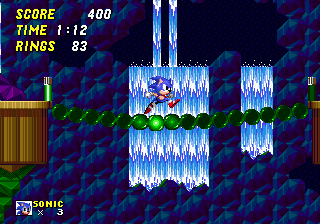 These green tubes are fitted within the landscape, but much like a lot of other tubes in the Beta they do not make Sonic turn into a ball, and he can run down them quite easily. The rabbit character animation seems to bug up a fair bit in the Beta for no particular reason. 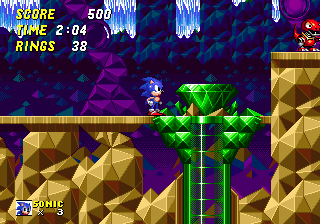 Also the Hidden Palace Zone includes water below, and has these large crystal structures for Sonic to walk across. 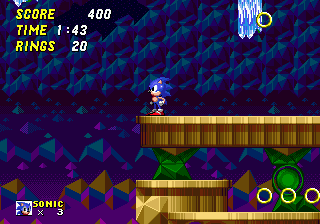 There are some breakaway platforms [see the right] which are in full working order for Sonic to jump across. 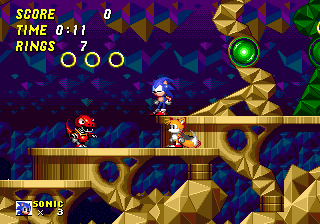 There is a single life in this level, and oddly it sports the Tails life icon. 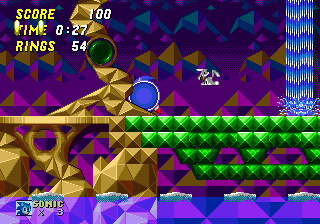 Some theorize that this was originally a Tails only level, and he was at some point the guardian of the Master Emerald, but there is no actual proof behind this claim. The second unknown enemy is this Batbot. 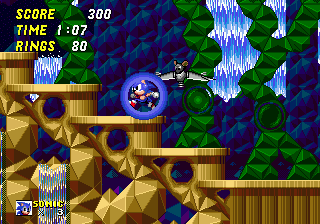 Complete with full animation and movement, this bat will swoop down and try to attack Sonic from above. 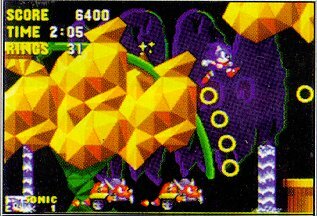 It's very similar to the Batbot which flies around Carnival Night Zone in Sonic 3. 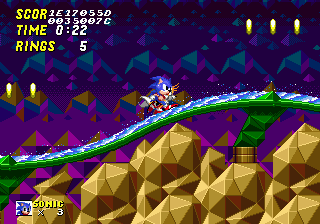 There are some bridges througout the level which will light up as soon as Sonic crosses them, as seen here. They will begin to bend downwards the futher in you go. This part of the level was actually seen in preview images, but was still quite different, showing that the level went quite far in the design process. This is the image of the same area from a magazine. The background used to be vastly different and rings would follow downwards. 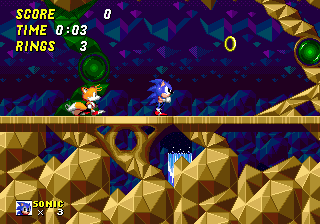 Sonic would also move further right, unlike our build where he moved off to the left. 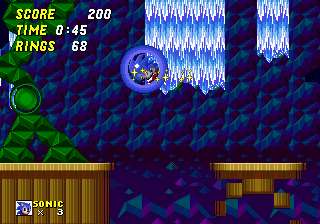 A difficult job for Sonic, to the left is a fall to his death, the only way out is to jump onto the platform below him. It's difficult, but is possible to reach without Debug. 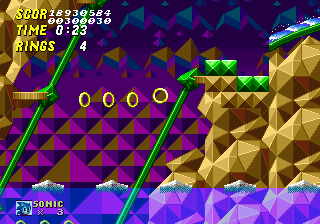 And here is the mysterious Master Emerald everyone talks about. 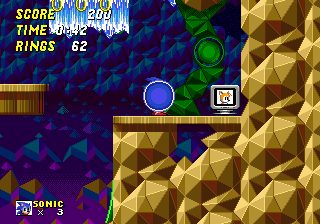 it sits ontop of a pipe which leads to nowhere, and seems to be used as nothing more than a stopper which Sonic would have to break open, but wasn't implemented in this version yet. Further down that tube is nothing. 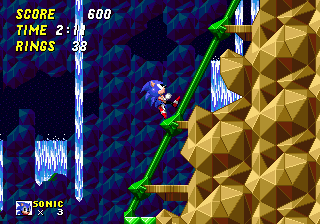 Sonic will simply fall to his death if he jumps inside using debug mode. This high degree diagonal slope is the early ending for Hidden Palace. 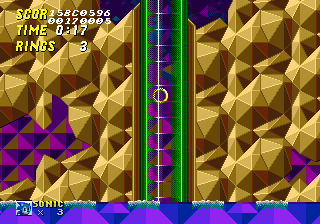 Sonic cannot get up it due to his physics, but all it leads to is the top of the map. Using debug however you can reach an area at the bottom of the map which ends up being the rest of the slope coming up from the waters. 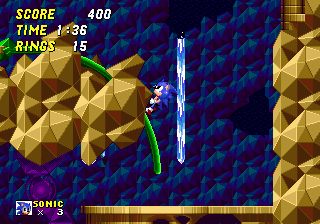 Furhter is this water slide which Sonic can run across. Most likely Sonic would be forced along it in later revisions. After this is nothing but a giant gap for Sonic to fall into. At the end of the map is a big wall stretching from top to bottom.